Ekurhuleni mayor Mzwandile Masina talks about government's efforts to reduce poverty and inequailty. Video: Nicholas Boyd; Editing: Lionel da Silva. The city of Ekurhuleni has committed R2.2-billion to invest in energy infrastructure over the next three years. 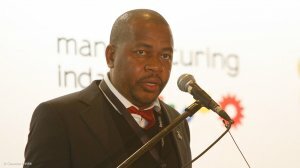 “Ekurhuleni is pursuing a renewable energy strategy that will generate 10 MW of energy by 2021 as part of its local strategy to ensure energy stability in the region, without completely relying on the national grid, Mayor Mzwandile Masina said at the yearly Manufacturing Indaba, in Kempton Park, on Wednesday. The city also plans to lay new electricity cables, expand supply and build a small substation to help meet energy demand. The infrastructure investment also includes a programme for electrification in informal settlements across Ekurhuleni, which will be completed by the end of this financial year and cover 16 000 households. Meanwhile, the city also wanted to improve the logistics network in the metro as part of improving its industrial and transport infrastructure,” he noted. Masina added that it was Ekurhuleni’s goal to become the strategic logistics centre for South Africa. Masina stressed that the country needed to diversify its economy to rely less on the export of raw minerals. “We must transform our [raw materials] into semi-finished and finished manufactured goods through local beneficiation, which has immense potential for economic growth by developing new industries and creating jobs and business opportunities for historically marginalised people,” he said. Masina further said South African manufacturers and policy-makers were faced with an urgent challenge to respond to growing markets in Africa. Infrastructure projects on the continent provide opportunities for South African companies to manufacture and export rail parts, locomotives, construction goods and machinery, he said. Masina also called on government and the private sector to cooperate and better respond to opportunities for growth in order to reduce poverty and inequality. Delivering the keynote address at the yearly Manufacturing Indaba, in Kempton Park, he pointed out that data published by Statistics South Africa (Stats SA) show that 48 000 jobs had been lost in the first quarter of this year. The biggest losses were recorded in the business services, trade and manufacturing sectors; however, other sectors recorded an increase in jobs. “It is reported that there were increases in employment in the construction industry with 12 000 employees and in the mining industry with 8 000 employees. We have also seen an impressive performance by the agricultural sector,” Masina said. He attributed the growth in employment in the construction sector to the impact of government's infrastructure roll-out programme. “Our continued investment in road construction, human settlements, schools and clinics has continued to provide much-needed economic relief to our country,” he stated. Masina urged government to implement practical steps to revitalise the manufacturing sector through exploring new markets, improving innovation and research and increasing overall investment. Government has committed itself to maintaining high levels of public sector investment in industrial sectors. He pointed out that investments made by the Ekurhuleni metropolitan municipality were complementing an already large industrial investment bill led by the Department of Trade and Industry. He encouraged the private sector to join the city by investing more and participating in its research and policy discussions to improve the state of the economy. “Working together, we can transform our economy to achieve growth, transform its structure, reduce general inequality and create more jobs,” Masina said.